The Jagdpanzer 38(t) (also known by misnomer "Hetzer" [Baiter]) is a rank III German tank destroyer with a battle rating of 4.7 (AB/RB/SB). 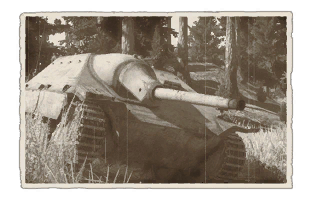 It was one of the first vehicles introduced in the opening of "Ground Forces" in Update 1.41 after the Closed Beta Test. The Jagdpanzer 38(t) presents itself as a low profile tank destroyer with a powerful main gun that could keep itself hidden and annihilate the enemy as they come, yet with an impressive front armour that could withstand an average amount of incoming enemy fire. Don't bother trying to crack through the front armour of the Jagdpanzer 38(t) unless in possession of a very good gun and ammo. Specifications list the front armour as 60 mm thick, but sloped at a 60 degree angle causes it to become 120 mm in effectiveness, quite thick for the battle rating it is in. Try to flank it to the sides or the rear and even in a heavily sloped format, there will be a likely chance the 75 mm shells will penetrate due to how thin the side and rear armour are (20 mm and 10 mm respectively). If unable to reach the side of the Jagdpanzer 38(t), an artillery or aerial strike could harass the Jagdpanzer 38(t) out of its comfort zone and even potentially disable it. If there are no other choice but to go against it up front, there are some weak spots in the front area. Starting from the smallest, there are some sweet spots around the gun mount area where a lucky shell might penetrate, but these are very unlikely so only aim for these in the worst case scenario. The driver vision port is a tempting target on the front, not only is it a weak spot, but behind that are the driver, gunner, and commander! If one shot gets through here cleanly, there is a very high chance of making a shot cause a crew knockout. The last weak point, and also the largest, is the lower glacis area on the vehicle. The lower glacis only has an effective armour thickness of 80 mm compared to the front glacis sloping armour of 120 mm, making it easier to penetrate for even weaker guns. Ammo racks of the Jagdpanzer 38(t). The Jadgpanzer 38(t) Tank Destroyer is armed with a 75 mm Pak 39 cannon, making it quite capable of taking out enemy armour at its battle rating. Use its speed -- up to 42 km/h (26 mph) -- to take up sniping positions while the enemy is still deploying. Keep the distance while engaging, as this allows the Jagdpanzer 38(t) to get more mileage out of its thin but heavily sloped armour on the small size. Watch out for aircraft and artillery. The Jagdpanzer 38(t)'s front armour is thick, but be wary of its weak armour (which is pretty much everywhere else). The top and bottom of the Jagdpanzer 38(t) are exceptionally thin, making it very vulnerable to aircraft, artillery fire, and explosive rounds on the bottom. The side and rear armour are also very thin, so any exposure of those towards the enemy is sure to end with the Jagdpanzer 38(t) as a flaming hulk. While the front armour is thick, weaknesses on upper frontal glacis is the driver's vision port, some small spots around the gun mount, and the lower glacis. The driver's vision port and gun mount spots are tiny and so only a lucky round would be able to reliably hit these areas, but make sure to try and conceal as much of the lower glacis plate as possible as it is easier to penetrate. As with any vehicle, research Parts and FPE modifications first to prevent any early knock-outs from fire or disabled systems. After these two, try to upgrade the vehicle's mobility and firepower, and aim towards the PzGr 40 shell, this will give a real edge in combat. 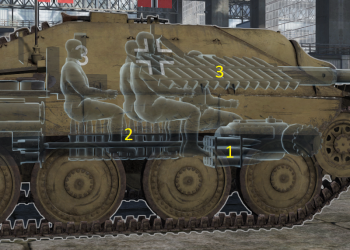 Don't use the Hl.Gr 38B HEAT round as it doesn't give enough penetration, but it can help against hull-breakable vehicles. Even for its rank, the Hetzer is small, and can use corners and cover that other tanks can't. At its rank, its main gun is very capable of dealing with any threat. Sloped armour on all sides, however, the sides and rear is thin. Equal armour all over the front with extreme sloping, so it has essentially no frontal weak spots. Hard to hit at range due to its size, and difficult to pen due to its armour angles. At long range, the sloped armour can even make high caliber shells ricochet. As with all tank destroyers, side and rear armour is thin and any shots can often be fatal. Not great in close-quarters, this vehicle is more suited for long-range engagements. With the gun being placed to the right of the vehicle it has a limited traverse range to the left. The roof armour is fairly thin, which makes the Hetzer vulnerable to artillery barrages and aircraft. Lower front glacis plate is thin in comparison to the entire front, cover this if possible. As with turretless vehicles, the Hetzer is more vulnerable to being flanked. Floor armour is very thin, and can be penetrated by 105 mm shrapnel. While the gun can penetrate most targets at its rank, it suffers at long range against some more heavily armoured targets. Driver, Gunner, and Loader are in-line with each other, making it easy to knock out the vehicle with a penetrating shot from the driver's visor. When Nazi Germany's situation in World War II turned to a defensive war, the need for tank destroyers increased and anything that could increased Germany's armoured fighting vehicle production was needed as the Allied AFV production tables dwarf Germany's AFV production. A new tank destroyer was in demand as the current Marder series was under protected, and the choice to utilize the Panzer 38(t) was done to not only build a more well-protected tank destroyer, but to keep in production the obsolete Panzer 38(t) chassis for the basis of stronger armoured fighting vehicles in the form of a tank destroyer. The development of what will be called the Jagdpanzer 38(t) started in 1944, made to be a more cost-effective tank destroyer compared to the newer Jagdpanther and Jagdtiger tank destroyers. The tank used the battle-tested Panzer 38(t) chassis (though with a modified suspension and better engine), giving it a reliable record compared to the heavier tanks of Germany. The tank destroyer featured a 60 mm thick front armour angled at 60 degrees, giving it a protection of about 120 mm thick, but the side armour of 20 mm at 40 degree was very vulnerable to any anti-tank fire, even from Soviet anti-tank rifles. It carried a crew of four and a powerful 75mm PaK 39 L/48 cannon. The Hetzer had enough punch to destroy most armoured vehicles it may have encountered during the war. It was also mounted with a 7.92x57mm MG34 remotely operated machine gun on the roof that was operated by the loader. Factories from Czech and Germany produced the Hetzer from April 1944 to May 1945. Approximately 2,287 were produced from 1944-45. Despite its common nickname as the Hetzer, no official documents actually referred to the Jagdpanzer 38(t) as so, but it was a nickname given to an experimental tank destroyer E-10. 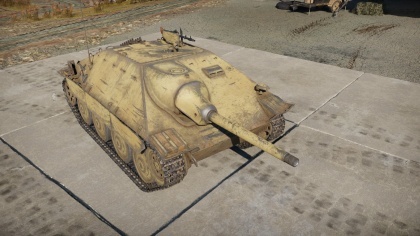 The E-10 looked similar to the Jagdpanzer 38(t), and a mix-up in the paperwork probably christened the Jagdpanzer 38(t) as the Hetzer that stuck, continuing to this day. The Jagdpanzer 38(t) was efficient as a tank destroyer, well-protected due to the sloped armour, easily concealable with a low profile, and armed with a potent cannon. The Jagdpanzer 38(t) was the more common late-war tank destroyer Germany had in 1944, and proved itself as a reliable machine due using a proven tank design of the Panzer 38(t). The small profile of the Jagdpanzer 38(t) made it very easy to conceal, and this provided much of its lethality in ambushes. The drawbacks of the Jagdpanzer 38(t) was on the vehicle's fighting compartment, as it was extremely cramped. The gun had a small amount of traverse to the left side, due to the cannon's placement to the right. The side armour was very thin and vulnerable to any anti-tank weapon. Due to the cramped compartment, the commander sat separated from the rest of the crew, and also making escape from the vehicle difficult, as there were only 3 hatches. The Jagdpanzer 38(t) proved itself a versatile tank destroyer platform in German service during World War II, as the Jagdpanzer 38(t) also was made into many variants of itself. In November 1944, Hitler ordered about 100 of these Jagdpanzer 38(t) to mount a flamethrower and named the Flammpanzer 38. An armour recovery vehicle variant of which 170 was made was called the Bergepanzer 38. There were many more mounting different weaponry, such as the 75 mm KwK 40 of the Panzer IV, 75 mm KwK 42 of the Panther's, one with the 105 mm howitzer, 150 mm sIG 33 infantry gun, twin 2 cm Flak, 75 mm K51 L/24 gun and such. After the war, the Jagdpanzer 38(t) continued to be produced in Czechoslovakia and saw service in Czechoslovakia and Switzerland. The post-war Jagdpanzer 38(t) in Czechoslovakia service was called the ST-I and the Swiss version was the G13, which equipped the 75 mm StuK 40 cannon from the StuG III. Due to the massive amount produced and the post-war production of the Jagdpanzer 38(t), many survivors could be found in the world. Though, most survivors may be the post-war designs in from Czechoslovakia or Switzerland mocked up to look like World War II era Jagdpanzer 38(t)s by removing the cannon's muzzle brake. Skin and Camouflages for the Jagdpanzer 38(t) in Warthunder Live. This page was last edited on 5 April 2019, at 15:31.